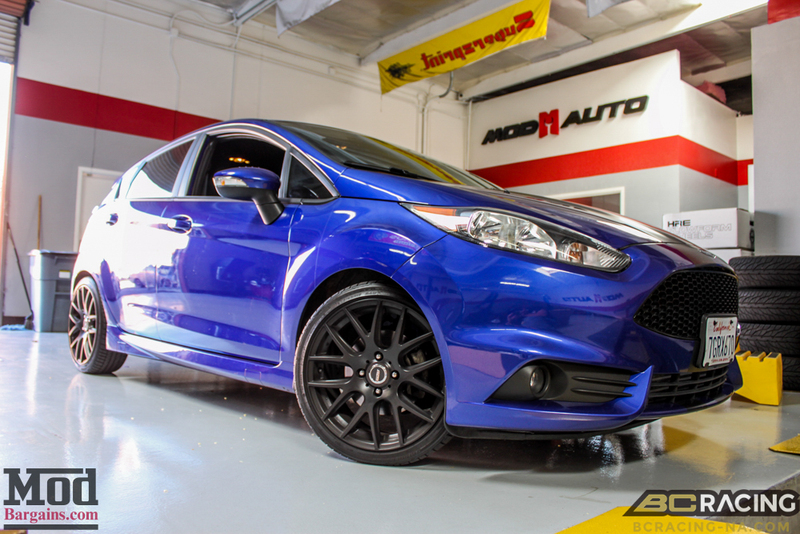 A while back we had this Performance Blue and Black Fiesta ST in the shop to get quite a few upgrades installed. 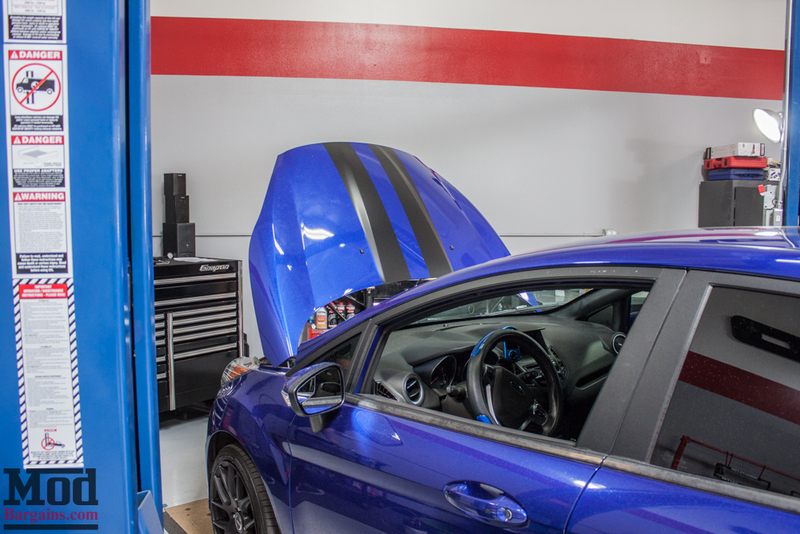 This black and blue striped hot hatch already sported a few upgrades like the Cobb Catted Downpipe, but today we’ll be finishing off the suite to make it a full Cobb Stage 3 Package for Fiesta ST, significantly improving power output, and giving it an alignment. 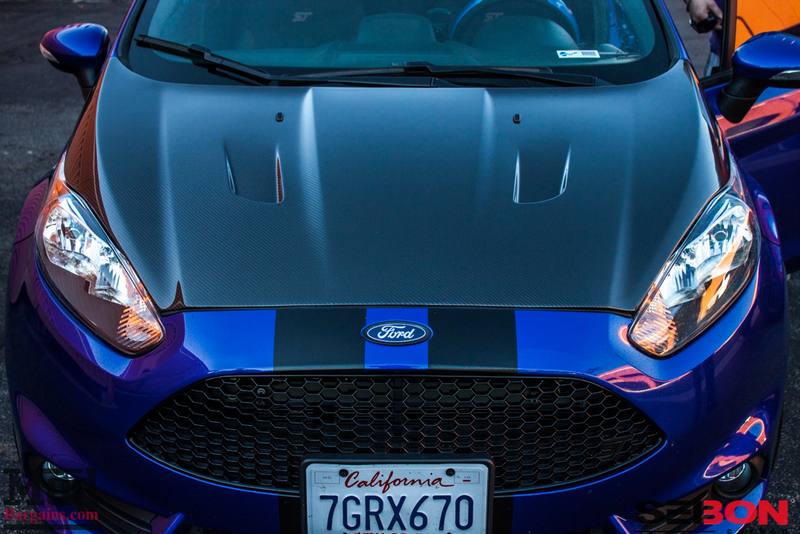 Behind the front grille you can see the bright aluminum of the Cobb Front Mount Intercooler for Fiesta ST peeking through. 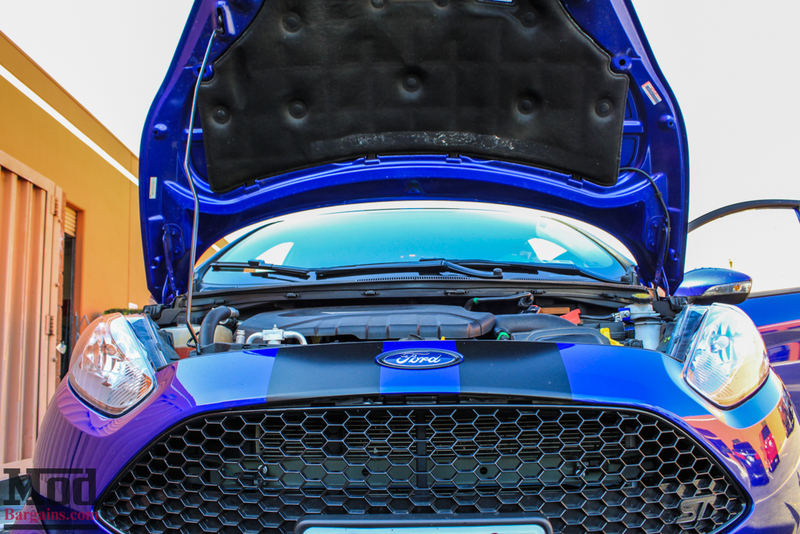 Here’s a shot of how the Cobb Fiesta ST Intercooler looks without the bumper mounted, for reference, on another car. 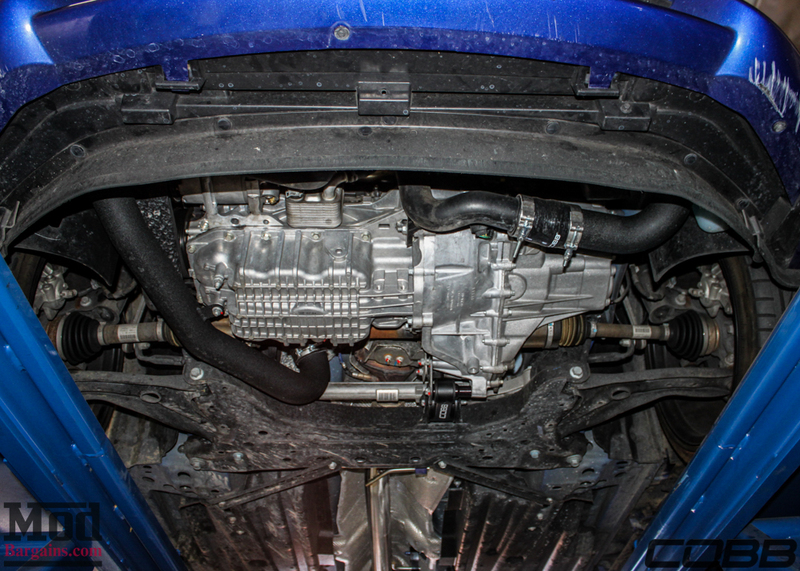 From below, the Cobb Hot & Coldside Chargepipes for Fiesta ST are clearly visible, enhancing throttle response by omitting the resonator, speeding up spool-up. 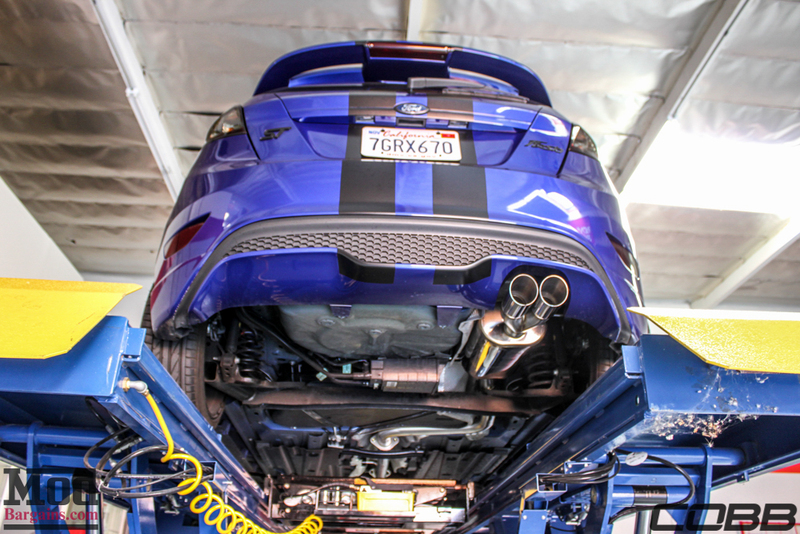 From this view, you can see the Cobb Exhaust for Fiesta ST.. 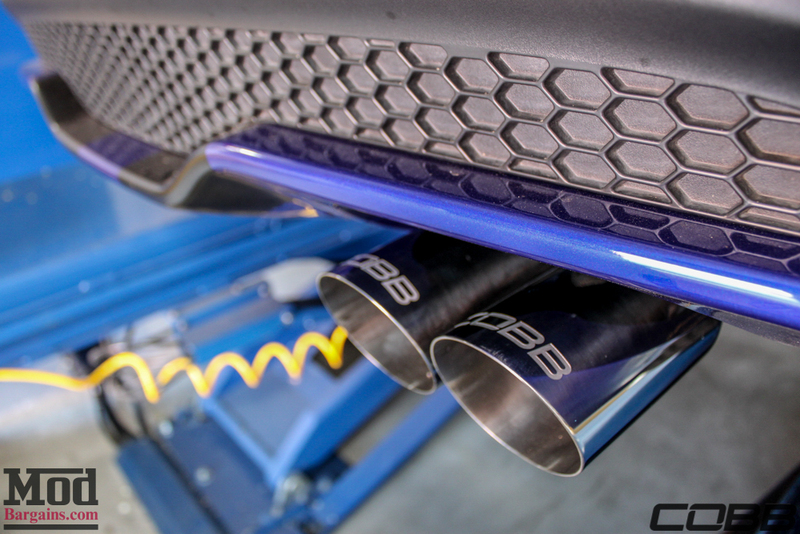 The mandrel-bent 2.5in tubing offers a significant improvement in exhaust flow and the flanged design means it’s a direct-bolt in install with no clamps to hassle with – and of course, mates up perfectly to a Cobb Catted Downpipe, which features a sports catalyst, so there’s no nasty unburnt fuel smell, and is street legal in much of the United States- however the owner had the downpipe already installed with the exhaust system elsewhere. 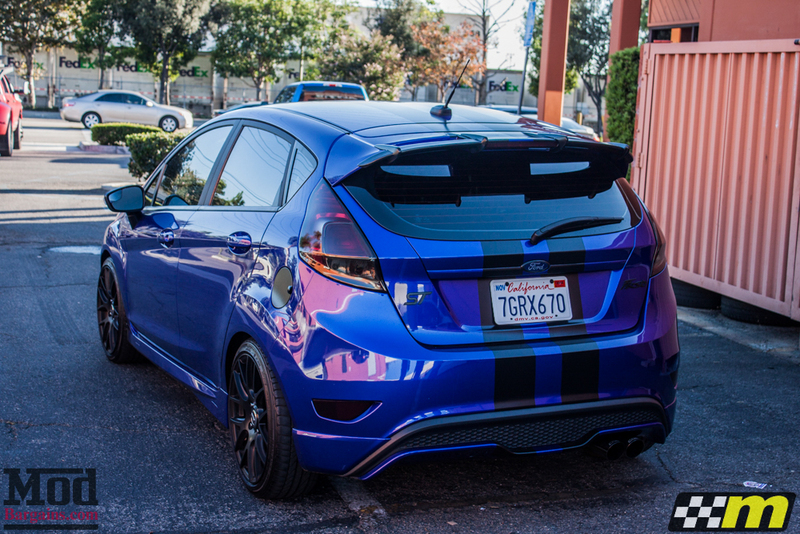 One of the best offerings on the market for Fiesta ST Exhausts, the Cobb Tuning exhaust looks, sounds and performs great. 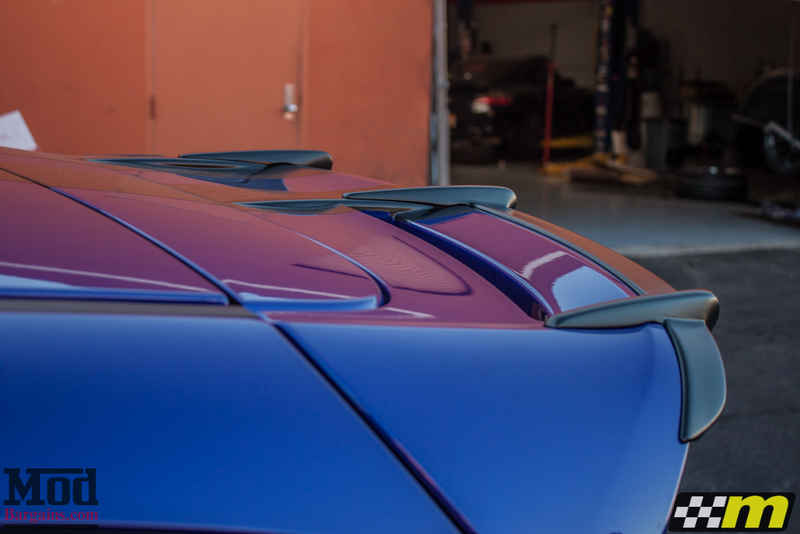 The bright dual slash cut tips with the laser-etched Cobb logo really adds to the rear end aesthetics of the car and fills out the opening in the rear diffuser nicely. 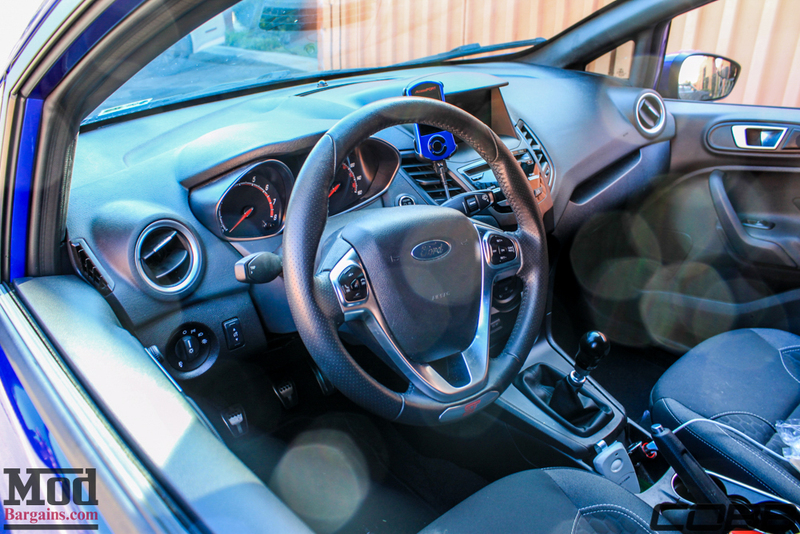 After he installed the Stage III suite of Cobb upgrades, of course the owner had to change maps on the Cobb AccessPORT for Fiesta ST to the Stage III map to suit the new equipment. 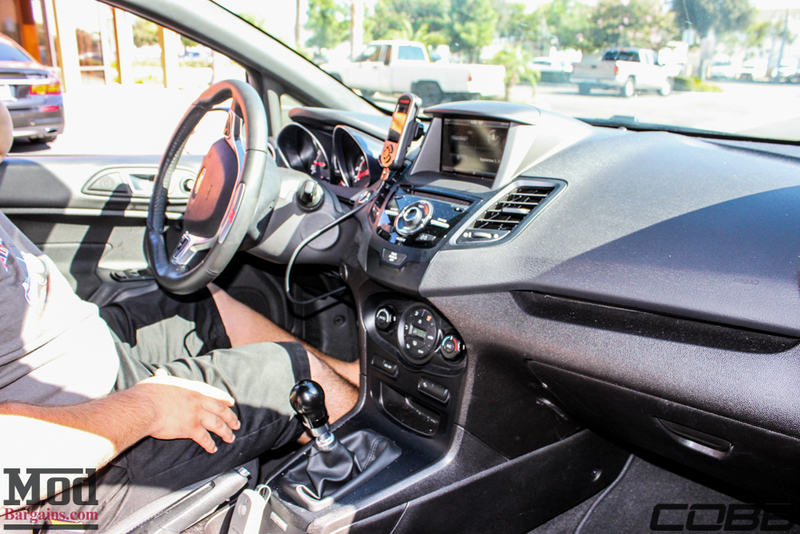 The owner’s choice of a Cobb Shift Knob is a great addition to the interior as well. 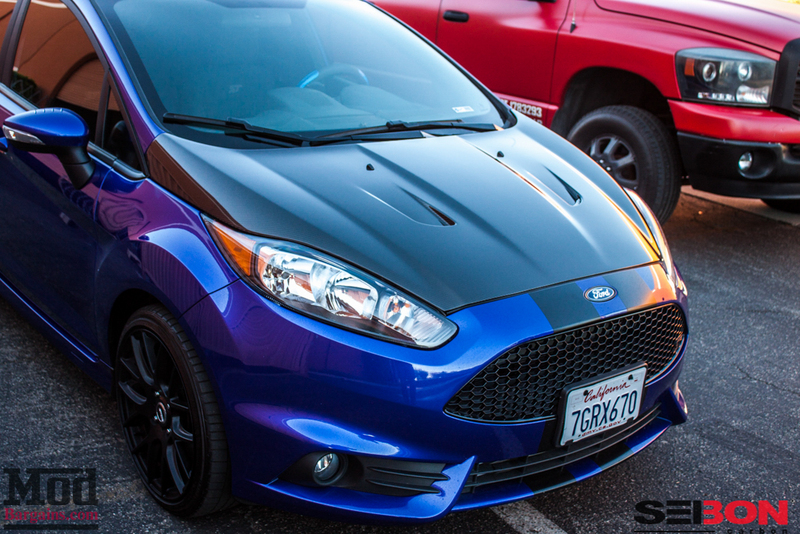 To help this Stage III Fiesta ST breathe freely, under the hood you’ll find the roto-molded high flow tubing of the CARB EO-pending Cobb Intake for Fiesta ST, which utilizes a large part of the factory airbox to create a true sealed airbox intake that’s very efficient and the plastic construction keeps heatsoak to a minimum. 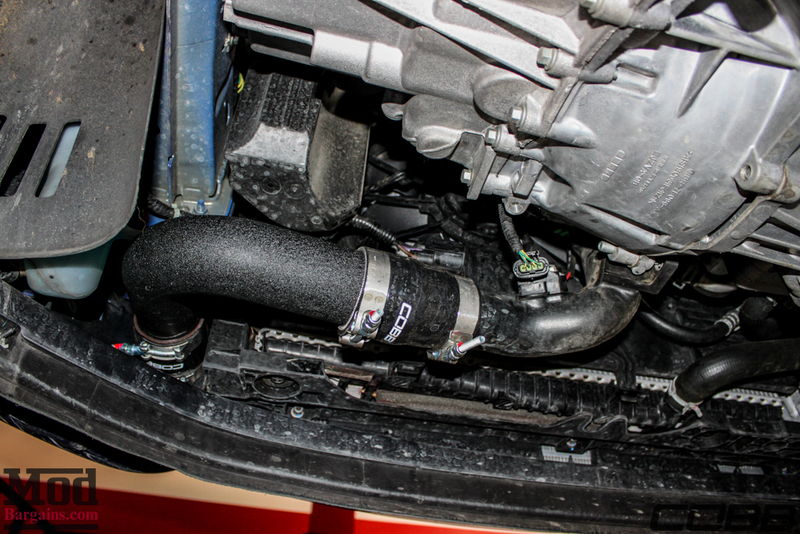 We installed this CARB EO-pending intake here at ModAuto and it certainly compliments the aesthetics of the engine bay. 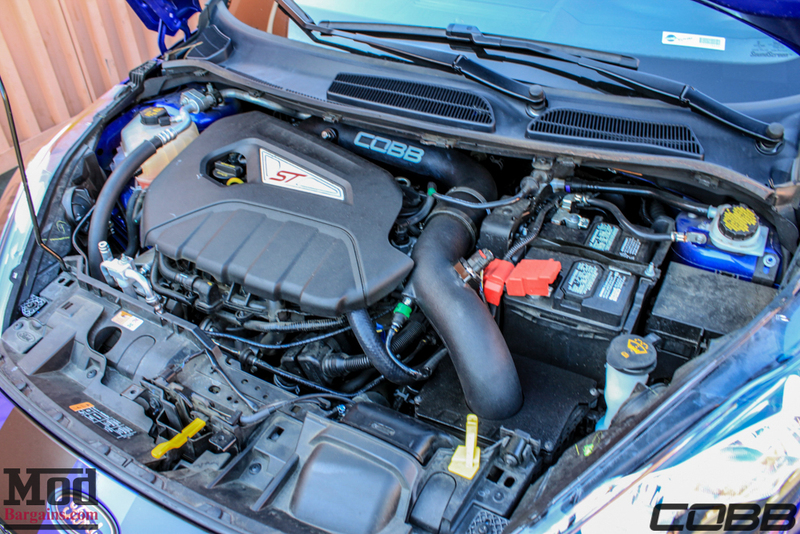 The Cobb Intake goes a different route than other “cold air intakes” on the market, offering true cold air induction by converting the lower half of the stock airbox and the inlets into a sealed cold air induction intake. 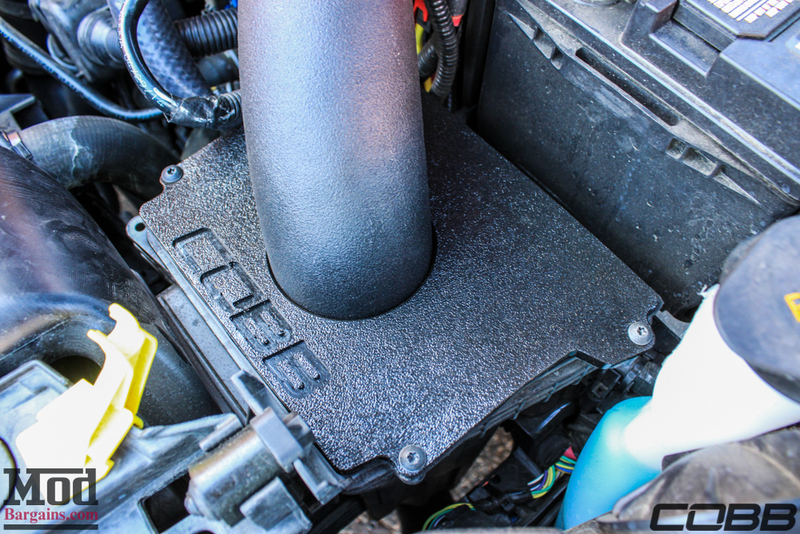 We took the extra step of trimming the forward radiator shroud so that the scoop feeding that new Cobb intake is drawing in fresh, cool incoming air, rather than the stagnant hot air against the radiator it’d draw from stock. 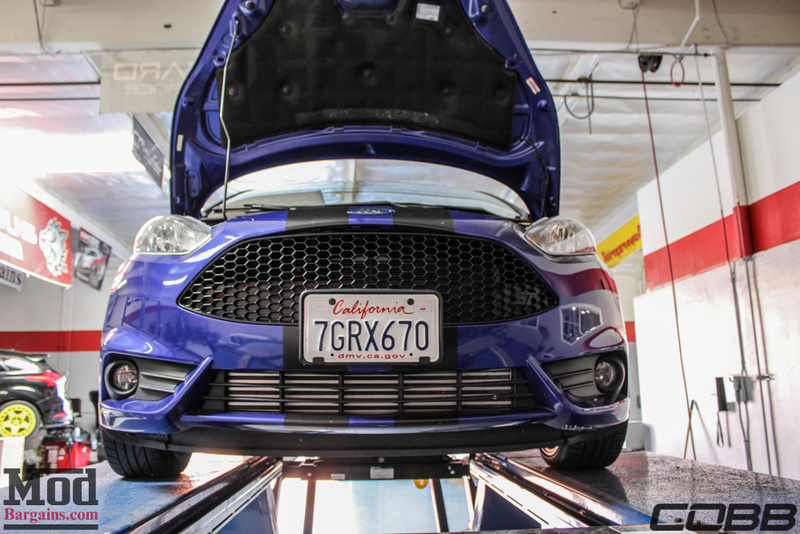 This simple tweak will yield more than 20*f intake air temperature drop in the stop and go conditions of SoCal and works well on both stock and modified ST’s still using the factory intake configuration. 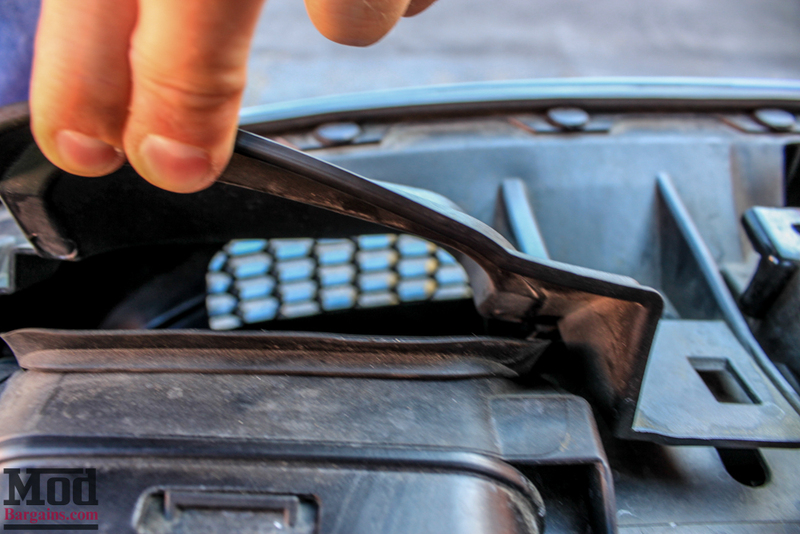 Even after installing the intake, we weren’t done quite yet, we still had a few upgrades in store. 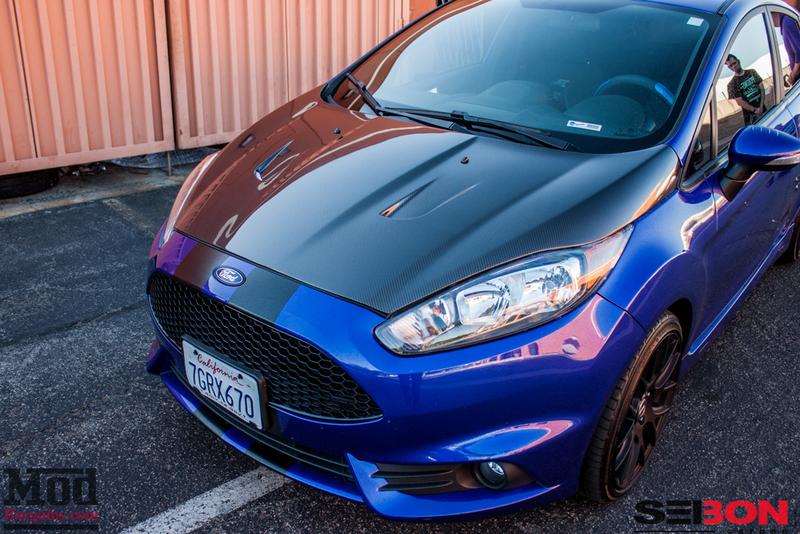 We had a few goodies in Carbon Fiber to give this Fiesta ST exterior a look all its own. What could be hiding under that wrapper, hm? 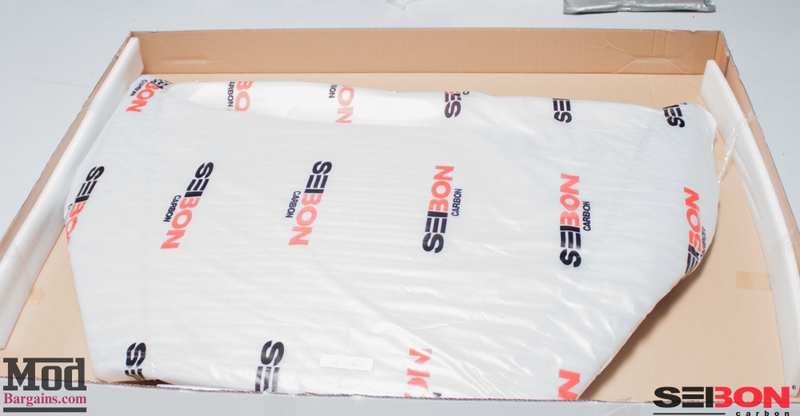 Obviously we have some goodies from our friends at Seibon Carbon, but what could it be? BAM! There it is – check it out. 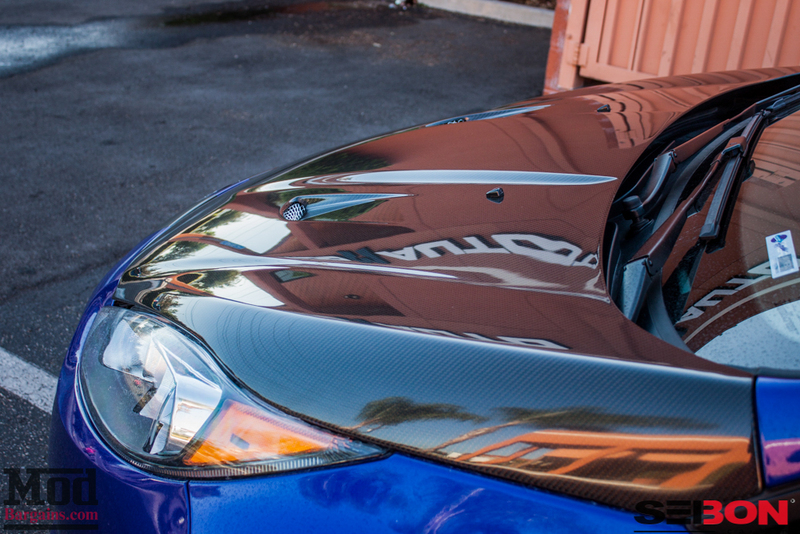 We installed a Vented Carbon Fiber Hood for Fiesta ST from Seibon Carbon to both lighten the front end and give the car a little extra heat-extraction. 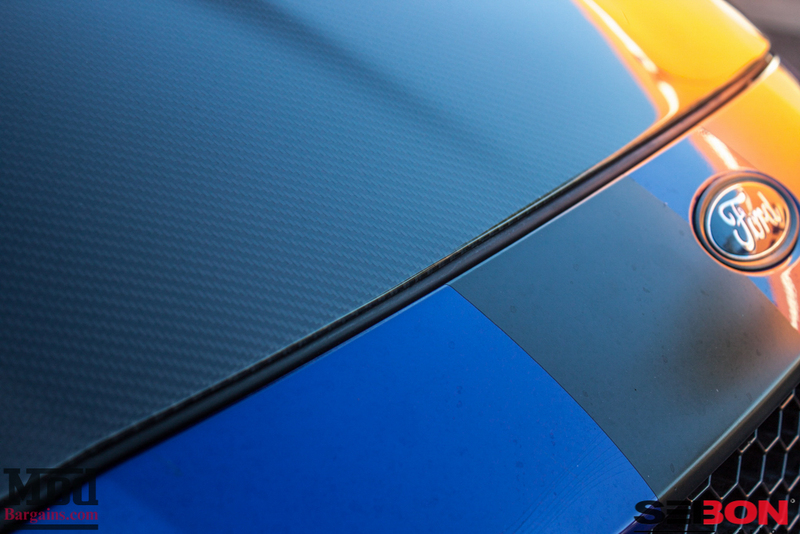 The cleanly integrated heat extractor scoops in the hood really give the car an aggressive look without being obnoxious. Menacing, like a well trained guard dog. 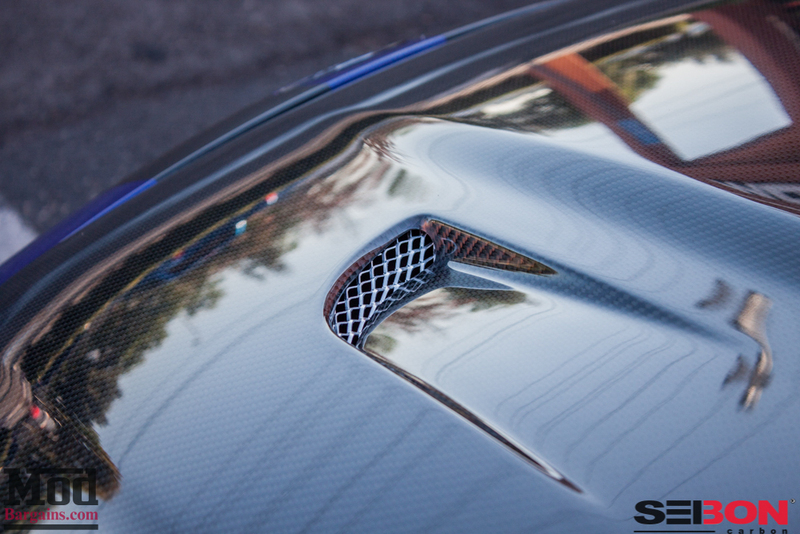 In the fading light, we could really see the detail in the carbon. 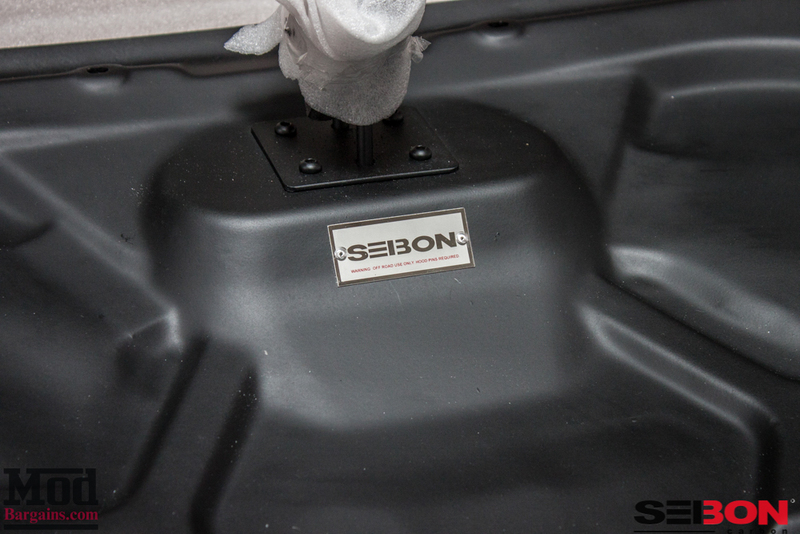 Unlike some “Vented” hoods on the market, this Seibon Carbon hood is actually functional. 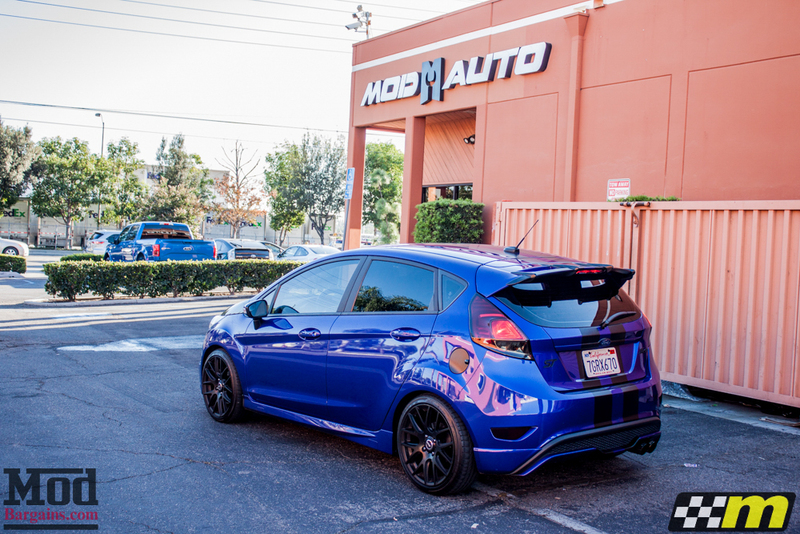 To give the rear end a bit more flavor, we also installed a set of mountune Rear Spoiler Extensions for Fiesta ST. 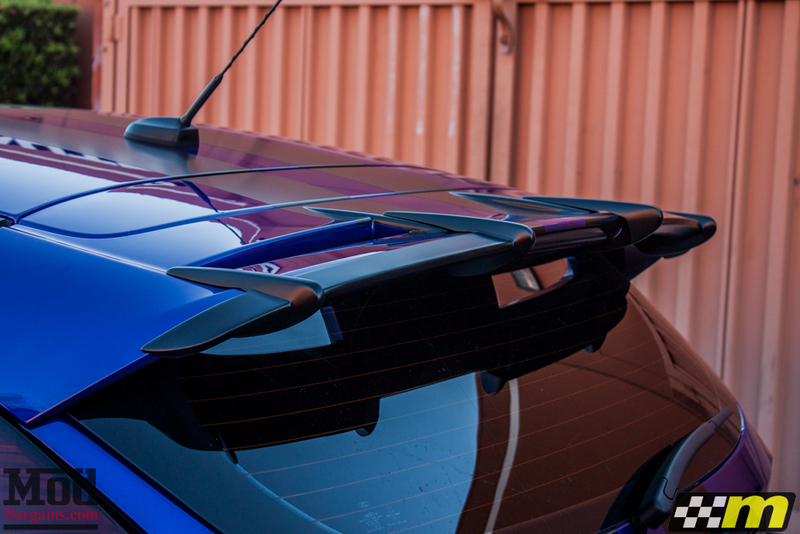 These fins give the rear spoiler a greater aerodynamic and visual effect, and really tie together the black and blue theme this Fiesta ST has going from stem to stern. As you can see, overall it has a major effect on the look of the car. 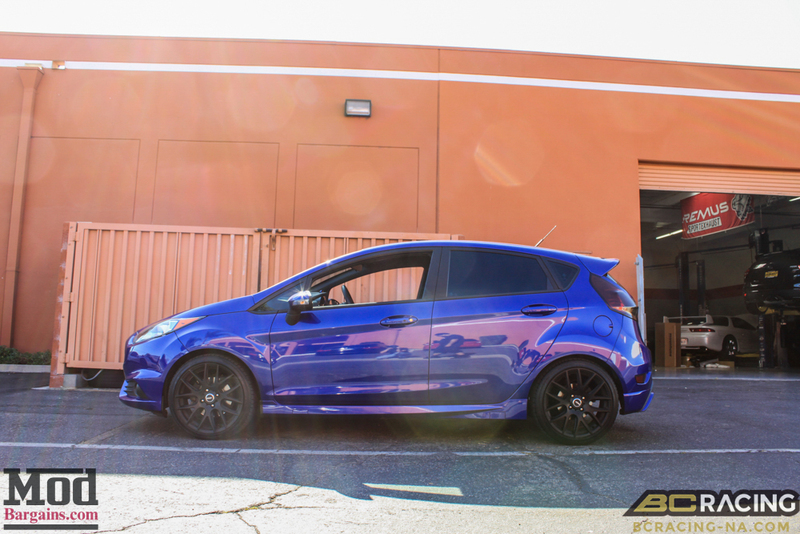 All told, the Mod Experts really transformed the look and performance of this Fiesta ST – making this black and blue hot hatch quite the little monster. 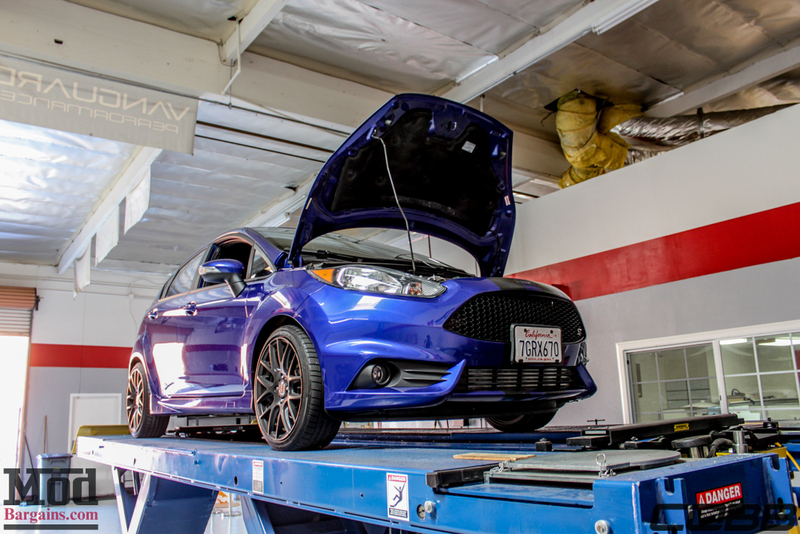 Interested in getting more power out of your ST? Need something installed? 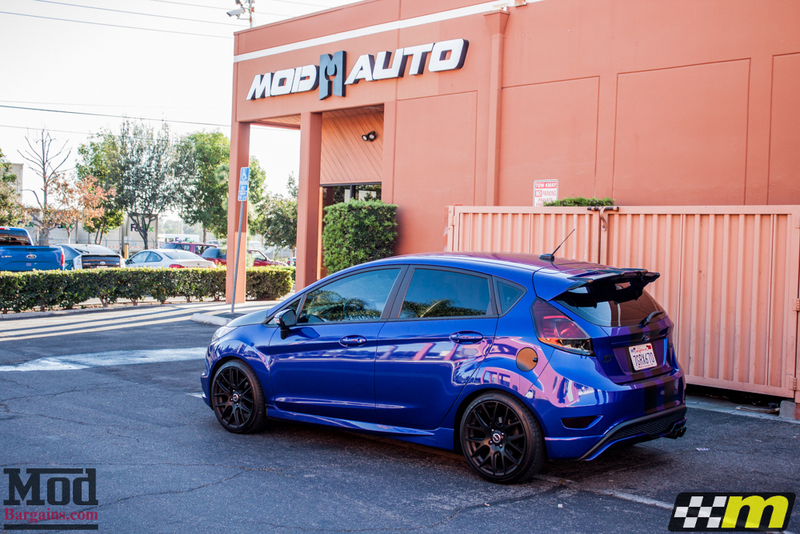 Talk to the Mod Experts, give us a call at 714-582-3330 to chat with our team of experts or stop by the ModAuto showroom in La Habra CA any day during business hours.